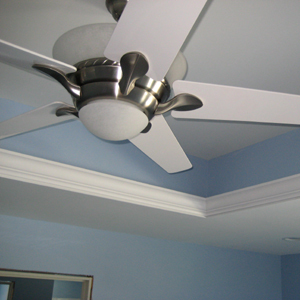 Ceilings are typically quite boring unless you create some special details such as tray ceilings. We built a really elegant tray ceiling in the custom Energy Star ranch style home we’re building for a customer. As you can see in the photos the tray ceiling really adds a unique feature to the room and breaks up a typically flat boring ceiling. The best part is these ceilings can be built using pre-fabricated wood trusses. These tray ceilings were built by designing the trusses with a step in them. 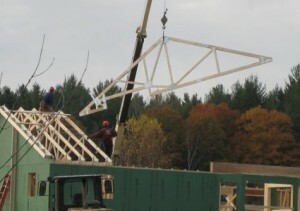 In the following photo you can see one of the tray ceiling trusses being erected. If you look closely you can see the 1 foot step up in the bottom chord of the truss. These stepped details can easily be incorporated into the truss design for very little additional money. The step in the trusses is built slightly larger than the finished tray ceiling to allow for shimming and strapping to attach the drywall. It’s important that you leave several extra inches to allow for that step as trusses rarely line up perfectly. In the attic we insulated with blown in cellulose insulation so it was easy to bury the entire tray area with plenty of insulation. This tray ceiling features crown molding with rope lighting behind it. 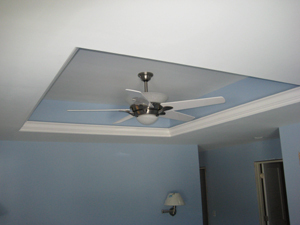 In addition the ceiling fan is installed in the tray to create plenty of head room. As you can see the home owners opted to paint the sides of the tray area the same color as the walls. Once completed you can see the dramatic visual effect this simple construction technique can bring to a room. You can make these almost any shape and style. The tray could have a sloping ceiling to it, it could have a barrel ceiling or even be circular in shape. The basic concept is the same with the trusses however you may need to do more furring out of the rough framing to achieve the desired shape.